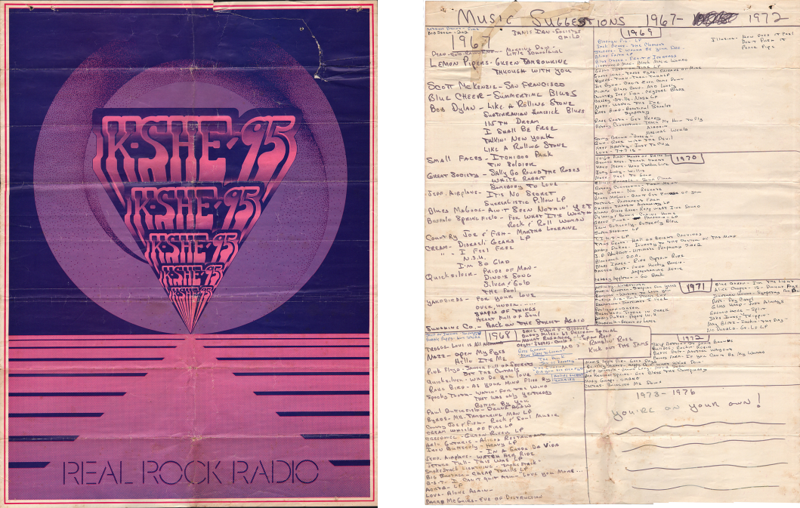 This poster, from Gary Kolander's collection, was used in the late 1970s at KSHE to make note of Klassics from 1967 to 1972. 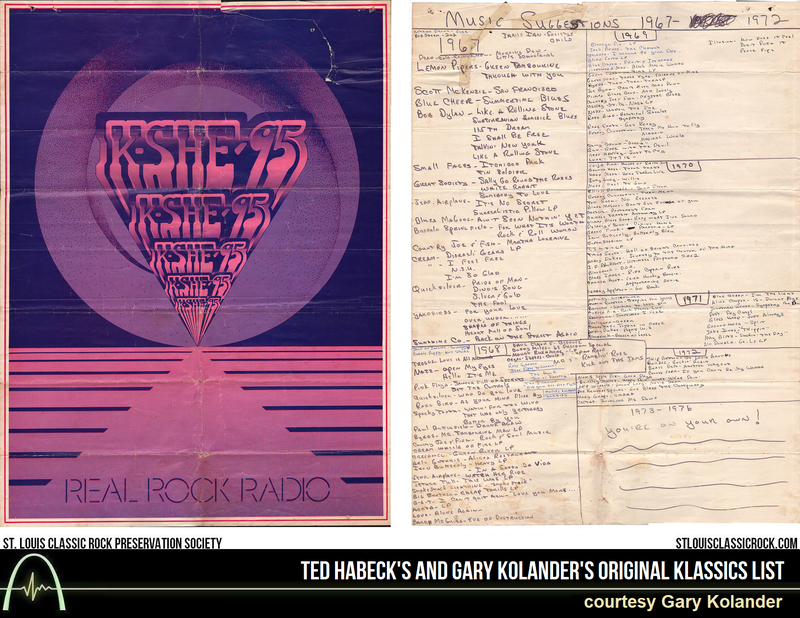 Per Gary, he and Ted Habeck made this list as a "cheat sheet" to keep their and fan favorites, that were not hits, in rotation tracks from the late 1960s and early 1970s. In essence, this is the First Klassics List! The handwriting is Habeck's. After reviewing the list, we've designated tracks that we already had in the Klassics Database as "Original Klassics" and those that were never mentioned on anyone else's Klassic list as "Lost Klassics"
115th Dream - Bob Dylan "Lost Klassic"
Back on the Street Again - Sunshine Company "Lost Klassic"
Cold Rain and Snow - Grateful Dead "Lost Klassic"
It's No Secret - Jefferson Airplane "Lost Klassic"
Not So Sweet Martha Lorraine - Country Joe & The Fish "Lost Klassic"
Sally Go Round the Roses - Great Society "Lost Klassic"
Society's Child (Baby I've Been Thinking) - Janis Ian "Lost Klassic"
Somebody to Love - Great Society "Lost Klassic"
Talkin' New York - Bob Dylan "Lost Klassic"
The Fool - Quicksilver Messenger Service "Lost Klassic"
Tin Soldier - The Small Faces "Lost Klassic"
White Rabbit - Great Society "Lost Klassic"
69 Freedom Special - Buddy Miles Express "Lost Klassic"
Because - Dave Clark Five "Lost Klassic"
Better by You, Better Than Me - Spooky Tooth "Lost Klassic"
Drunk Again - The Butterfield Blues Band "Lost Klassic"
Intro/Ramblin' Rose [live] - MC5 "Lost Klassic"
It Could Be We're in Love - The Cryan' Shames "Lost Klassic"
Next Plane to London - The Rose Garden "Lost Klassic"
Rock And Soul Music - Country Joe & The Fish "Lost Klassic"
Smell of Incense - Southwest FOB "Lost Klassic"
Smokestack Lightnin' - Smokestack Lightnin' "Lost Klassic"
Son of Fantasy - The Hook "Lost Klassic"
That Was Only Yesterday - Spooky Tooth "Lost Klassic"
Up On the Roof - The Cryan' Shames "Lost Klassic"
Watch Her Ride - Jefferson Airplane "Lost Klassic"
And Lonely - The Climax Chicago Blues Band "Lost Klassic"
Black Magic Woman - Fleetwood Mac "Lost Klassic"
Crystal Blues - Country Joe & The Fish "Lost Klassic"
Don't Push It - The Illusion "Lost Klassic"
How Does It Feel - The Illusion "Lost Klassic"
I Wanna Be Your Dog - Iggy Pop & The Stooges "Lost Klassic"
Magical World - Rotary Connection "Lost Klassic"
Peace Pipe - The Illusion "Lost Klassic"
Savoy Brown Boogie [live] - Savoy Brown "Lost Klassic"
The Clearout - Jack Bruce "Lost Klassic"
Reap What I've Sowed - Climax Chicago Blues Band "Lost Klassic"
Run Shaker Life - Hard Meat "Lost Klassic"
Thank Christ for the Bomb - Groundhogs "Lost Klassic"
Willie the Pimp / Lie Back and Enjoy It - Juicy Lucy "Lost Klassic"
All Along The Watchtower - Affinity "Lost Klassic"
Back Street Luv - Curved Air "Lost Klassic"
Breach of Lease - Bloodrock "Lost Klassic"
Cheer - Potliquor "Lost Klassic"
Sleeping for Years - Atomic Rooster "Lost Klassic"
Sometimes I Feel Like I Just Can't Go On - The Damnation of Adam Blessing "Lost Klassic"
Bringing Me Down - Cactus "Lost Klassic"
Brown Lady - Help Yourself "Lost Klassic"
Good Days - Mom's Apple Pie "Lost Klassic"
Happy Doing What We're Doing - Brinsley Schwarz "Lost Klassic"
If You Can't Be My Woman - Boones Farm "Lost Klassic"
Rockin' Robin - Bulldog "Lost Klassic"